Make a statement in your bathroom with the Jessica Simpson Penelope Bath Rug. This rug features a soft and absorbent cotton construction with a trellis pattern in a variety of on-trend colors to suit your decor. The product is nice but I'm giving this two stars because the color was not even close. Rainy Day clearly shows online as a green rug. But the color is beige. It was not even close (see photo). Can't be bothered with returning but jeez - lets get the color at least close. We bought this for our guest bath, which is vintage 1950's, and love how it looks! The size and color (aqua) are perfect and it is so soft and fluffy! We've received so many compliments! This is our first purchase from Jessica Simpson and will not be our last! Would prefer a non-skid backing but understood not a feature for this product. Very nice and thick. Unfortunately for me, too thick, it was tricky to open door without rug getting snagged & crumpled. Gave to my daughter. Therefore, cannot comment on the durability of washing the item. 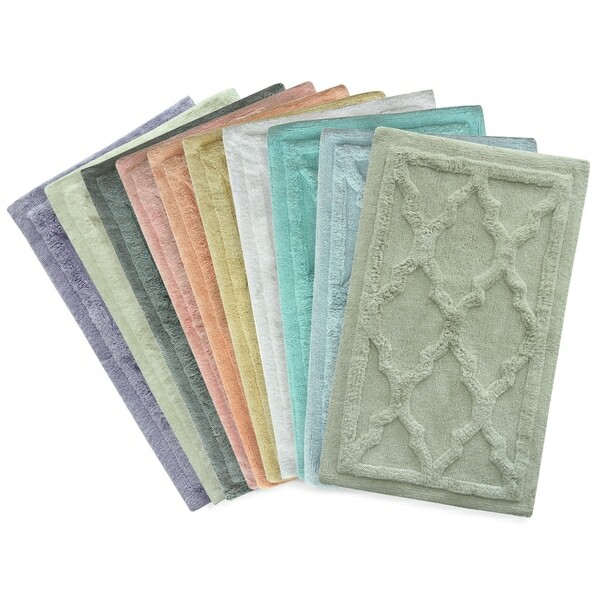 I love this rug, I put it in my Mistress Bathroom the color and the size are perfect. The rug and soft and feminine without being too girly. I love this product and want this rug in other colors through out my home. Plush and nice design. The white is so white that my bathroom looked dingy with rug in it. Have to return and get a rug with color. Nice bath rug. Super soft and washes well. 3 stars only for this because the color I received is a light light silver gray. I ordered FROST GRAY which is the darkest option shown on the Overstock product page. The rug I received shows the color on the tag as FROST GRAY. This is waaaaay too light for the intended bathroom. On the OTHER hand, this seems to be a really nice rug! Not worth the shipping cost to send back so I will be looking for a dye vat, and get what I need that way. Very nice bath rug, soft and the design on it is very pretty! I plan to buy several more of these to put in the rest of my bathrooms because the quality seems to be top notch and I’m sure they will hold up very well! Rainy Day color was not as shown, had to return. Didn't like these as much sI thought I would. Used them by the bed and found that the designs we raised so much they were uncomfortable to step on. "Is "Rainy Day" a light gray color?" Yes, it is a light gray color. "Is it reversible ? Is it Cotton on both sides ?" It is very good quality! Quiet think and feels very nice!